Why a sequel? Readers, you asked for one! Three women, three very different journeys, all find themselves at Pendennis Castle in the summer of 1646, besieged and exposed to all villainies. Yet inevitably the great gates of the fortress on the Fal would open. Would their fortunes still depend upon the men around them or would Fate deal them a kinder hand? And if one prevails against him, two shall withstand him; and a threefold cord is not quickly broken. 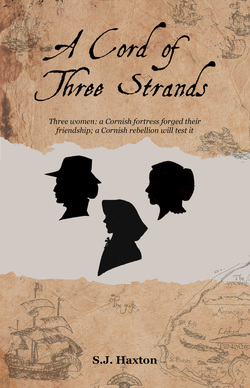 August 1646: in the aftermath of Civil War, three women, brought together by Fate at a beleaguered Royalist stronghold on the Cornish coast confront new challenges in a world turned upside down. Men dictate the terms upon which the women’s lives depend. A wife, Mary Tremayne, will face a choice between her husband and her home. A widow, Hester Mattock, pins her hopes on the home that her husband left to her. Her husband hoped Grace Fenwick was dead; can she change her name to change her fortunes? When the Parliamentarian victory brings only an uneasy peace to a war-weary nation, the spirit of rebellion and the Royalist cause stir in the depths of Cornwall. These three women will face circumstances which will test to the limit their spirit, their resourcefulness and their courage. The future is unknown; the present is uncertain, but the past forged bonds that are bound to endure, for a cord of three strands is not easily broken.